It is official. Birtukan Mideksa is entrusted to reform the election board before the next general election. The House of People’s Representative approved today the appointment of Birtukan Mideksa as National Election Board Chairperson. She will be replacing Samia Zakaria who reportedly resigned recently, according to Ethiopian Broadcasting Corporation (EBC) report. Birtukan Mideksa returned from the United States, with invitation from Prime Minister Abiy Ahmed’s administration, about two weeks ago. Immidiately before her seven years of exile, she was a political prisoner and had co-founded and led Unity for Democracy and Justice (UDJ). It is Prime Minister Abiy Ahmed who proposed her to the parliament to lead election comission. “…She does not give in even for the government when it is not right. 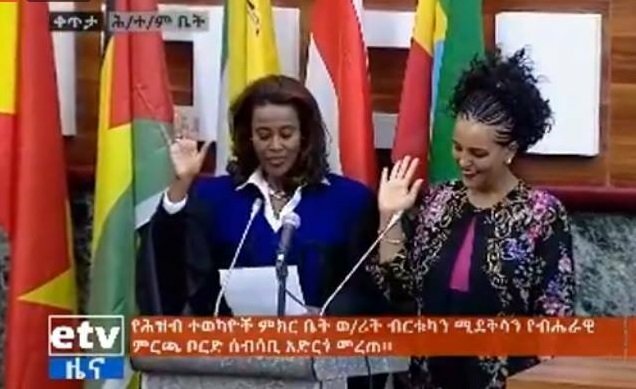 She has a conviction for law and order and has practically demonstrated it by paying a price,” Abiy Ahmed said in the parliament giving his testimonial about the person who was once called Ethiopia’s Iron Lady. As well, the prime minister argued, or rather informed, parliamentarians that her appointment is a step in the right direction in terms of building a neutral and credible democratic institution citing the critic that has been labeled against the government for a long time in relation to election board. What makes Birtukan Mideksa unique from the previous election board chairpersons, in the eyes of Abiy Ahmed, is that she is not ” from this area,” in his word, which he used to imply that former officials in the institution have affiliation with the ruling coalition, Ethiopian People’s Revolutionary Democratic Front (EPRDF). So the appointment of Birtukan Mideksa is part of government effort to reform democratic institutions before the next national general election which is expected to take place after a year. Birtukan Mideksa has not changed her citizenship status, according to Ethiopian Broadcasting Corporation report. After the parliament voted on the proposal (there were 4 opposition and 3 abstain vioces), Meaza Ashenafi, who is appointed as president of the Federal court only a few weeks ago, officiated the swearing in ceremony of Birtukan in the parliament. Now 43, she was born and raised in Addis Ababa, in Ferensay Legasion neighborhood, and has one daughter. In terms of academic background, she studied law at Addis Ababa University. In the US, she completed masters’ degree in public policy and administration from Harvard University. She made a name for herself as a judge in Ethiopia when she passed a verdict on politically motivated charges against Siye Abraha, who was one the top TPLF officials at the time, in his favor which brought her into a collision course with the then TPLF dominated government. Thereafter, she was drawn to the world of politics and emerged as a prominent opposition figure. And she has been arrested twice and subjected to egregious human rights violations. Soon after her release in 2011, she left for the United States where she stayed for seven years. In her stay, she got a fellowship opportunity with National Endowment for Democracy (NED) and has carried out numerous researches on matters related to democratic governance.